Home » Private: Media » Calling all runners! Join the 2019 Marathon Team! Calling all runners! Team Brookline, the official Brookline Team of the Boston Marathon, is seeking runners for the 2019 Marathon Team. Applications are now available for interested runners to join the 2019 Team Brookline marathon team. Interested runners do not need to be Brookline residents to participate; they just need a commitment to the team and to our causes. Team Brookline is a committed group of adult runners who train together for the Boston Marathon. 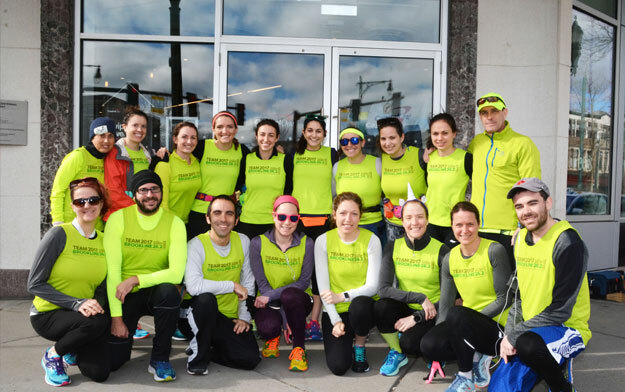 When runners train and run with Team Brookline, they strengthen the Brookline community, expanding access to mental health care, literacy, the arts, youth development programs and education. •	Guaranteed entry into the 2019 Boston Marathon. To participate on Team Brookline, runners must commit to raising a minimum of $6,000 each, though many past runners have surpassed the minimum. There is a non-refundable $25 application fee, and selected runners are responsible for paying the Boston Athletic Association’s registration fee. Applicants will be selected based on running experience, fundraising ability and passion for participating. One of the world’s oldest marathons, the Boston Marathon is a popular event for both runners and spectators — it is also one of the hardest marathons to get into. Each of the eight towns along the Boston Marathon route is given a number of race entries as a thank you for their support of the race. In 2012, the Town of Brookline became the first town to take these invitational numbers and create its own charity program, giving members of the community a chance to run in a historic race and establishing its official Boston Marathon team: Team Brookline. Since its inception, more than 150 runners, supported by friends, family, neighbors, colleagues, and each other, as well as local business community, have raised nearly $1.5 million to strengthen the community and make a true impact in the lives of all who live, work, or go to school in Brookline. Applications will be accepted until Friday, October 12, 2018. For questions, please contact Cyndi Roy Gonzalez at Cyndi@teambrookline.org.